I meant to post this last week, but I guess it just slipped my mind. Oh well, I guess that means more weeks worth of filler content while we wait for Forces. Keep in mind, this for the finale of the Birth of Blacklight arc, not the premiere of the Dawn of Chaos arc that was published 5 days later. Since this was supposed to be a part of the last episode, I have a lot less to say. The first thing that comes to mind is how I wanted Shadow’s temporal displacement to be resolved. The way I saw, from the moment I had parallel-Sonic mention the one-way nature of the time machine, I had three options. The first was, as actually happened, to come up with some new convoluted means of time-travel. The second was also quite an enticing option, which was still referenced in the end. I considered having Shadow be put back in a stasis pod alongside Blacklight, spend another 40 years unconscious, to be awoken only when Blacklight is awoken as well. I was very much intrigued by the thought of having the two end with the same fate, and having Shadow dedicate himself solely to the task of protecting the world from his doppelganger. It would also be a nice, convenient way to exclude Shadow from the next story arc, not being reawoken until the following one. Making that choice would have required me to remove Maria from the equation, however, as she would have no means of returning home, and I think that would have taken away too much from the rest of the story to be worth it. There would have been a couple other minor problems as well. The third option is actually what I was originally planning on doing. That would be to introduce a new Chaos-wielding character who could use Chaos Control to open another rift with Shadow. I had already conceptualized this character’s basic characteristics, personality, abilities, and even the dynamic he would have with Shadow. But then I started planning more specifically for Shadow’s first few interactions with Blacklight, and there ended being no good place to introduce an extra character before they had made their first time jump together, cutting out half of my chances. I suppose I could have altered his story to make him come from another time period instead, but I feel that would have ruined too much of what I had planned for him. And besides, by that point, I had decided that introducing another character that late in would seem silly, and take too much focus off of Shadow and Blacklight. This guy would be a “minor” character, he wouldn’t even get a sprite for this website. Anything I could do with him from that point would seem like a silly contrivance, like he’s only there because he has to be. Anyways, this guy hasn’t been forgotten about just yet, as he’ll certainly get a proper introduction later in the series. But even now, remnants of his existence can still be found. Gerald’s story in Shadow’s dream/flashback referred to this very character. Speaking of that sequence, it was a reference to more than just the past and the future of this series. Some readers may recall from Cast by the Light, my Sonic Adventure 2 novelization, that I added a look into Shadow’s thoughts immediately after his final loss to Sonic aboard the ARK. His thought: “what is it about him…that allows him to fight me…to fight like me? Could it be…what the Professor told me about?” What the Professor told Shadow about was this very story, the story of the Controller. I tried to make it as obvious as possible, but I should confirm that the realm in which Shadow and Blacklight faced each other for the final time is the very same place seen in a vision by all three hedgehogs in the premiere of Crisis of Chaos. This wasn’t something I was originally planning, and so I had to do a little bit of working around the fact that Shadow didn’t behave as if he had already been there when he saw it in that premiere. His specific statement was explained by Blacklight’s line in this episode, “Heck if I know.” Shadow doesn’t necessarily not recognize the realm, but, with his newfound learnings under Chaos, he is realizing for the first time what the energies are that he asked Blacklight about in this episode. Lastly, I want to mention the meaning of the password, “MARIA.” As you may recall from Sonic Adventure 2 and/or Cast by the Light, that was the very same password which Eggman had to use to wake up Shadow from his pod. It never made sense to me that this was the case. If the military found Shadow and sealed him in a stasis pod, why did they seal it with a password that means nothing to them? Now, I’ve seen a few possible explanations, but none of them quite make perfect sense. When I first scheduled this arc to be written, all I knew is that it would be the introduction to Blacklight. I already had the framework of his backstory in mind, that Gerald’s son created him in an attempt to perfect the Ultimate Life Form after its initial failure. In building upon that backstory into this story arc, my central idea was to use this opportunity to fill in the blanks between Maria launching Shadow’s escape pod, and the military having Shadow safely sealed away. In light of everything else that happened during this arc, that original, core idea almost got lost. But in the end, I wanted to make sure that the original password problem wasn’t forgotten. The final explanation: Alfred found Shadow’s escape pod, and transferred him to a stasis pod sealed by a password of his own daughter’s name. The military obtained this pod, but never managed to change the password. There’s an interesting little note about how the military found Shadow’s pod, but I’m going to have to ask you to stay tuned for that answer. 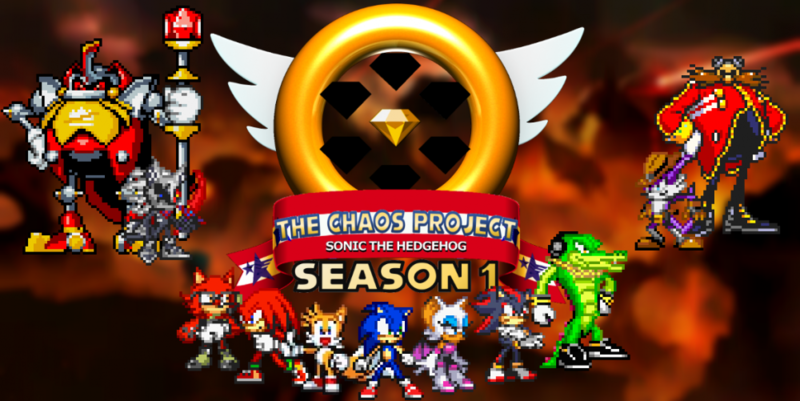 This entry was posted in Episode Review and tagged Birth of Blacklight Arc, Blacklight the Hedgehog, Cast by the Light, Chaos Control, Chaos the Hedgehog, Dawn of Chaos Arc, G.U.N., Ivo "Eggman" Robotnik, Lieutenant Alfred Robotnik, Maria Robotnik, Professor Gerald Robotnik, Shadow the Hedgehog, Sonic Adventure 2, Sonic Forces, Sonic the Hedgehog, Space Colony ARK, The Flow of Chaos, Unkown Chaos-Wielding Hedgehog by Chaos Project. Bookmark the permalink.